Paragliding in Tenerife. If ever there was an environment perfect for the amazing sport of paragliding - it is Tenerife. With its light winds, useful thermals and superb scenery to fly over, you can't hope for better. 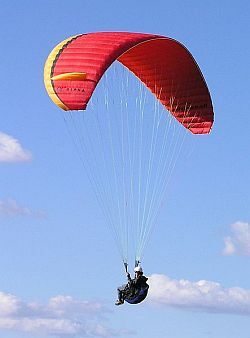 Paragliding is a slightly more user-friendly activity than hang-gliding. You sit in a sort of sling, suspended under a parachute and glide peacefully over the varied landscape. 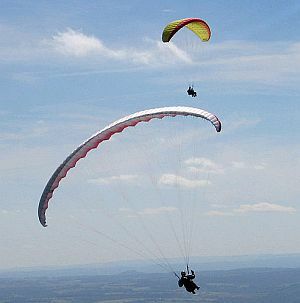 The sport also lends itself to "tandem flights", where a complete beginner can be paired with an instructor. When I lived at Paloma Beach, in Los Cristianos, you could always see a group of paragliders sailing over the Roque del Conde, the flat-topped mountain rising behind the town. There are six main routes recognised as ideal for paragliding, but this is by no means an exhaustive list. Izaña is the area of Tenerife where the astronomical observatory is found and this route traces a long descent over the La Orotava valley, eventually landing at Playa Jardin. Again, a long descent of some eight miles over awe-inspiring scenery. A nice coastal flight of only 3½ miles. It can easily be done in the other direction. This route takes you over Icod el Alto and Los Realejos before landing on the beach. A southern route, where you make the most of the warm air thermals. Another thermal route, taking in Valle de San Lorenzo.